Thank you again Erika. You really made my labour an unforgettable experience and crazily enough a good memory! People focus so much on the fear and pain of birthing. 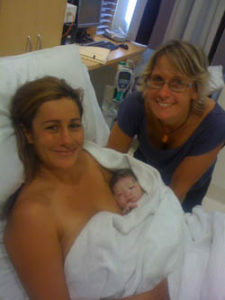 At this labour and birth there were huge smiles and laughter for the wonder of it all. In the background you can see the midwife who is dedicated to her work and was just so happy for the couple as they receive their baby.